You can export data from your Access database to a Microsoft Word document by using the Export - RTF File Wizard. This article explains how to use the Export - RTF File Wizard and how to save your export settings as a specification for later reuse. You can export a table, query, form, or report to Microsoft Word. When you export an object by using the Export - RTF File Wizard, Access creates a copy of the object's data in a Microsoft Word Rich Text Format file (*.rtf). For tables, queries, and forms, the visible fields and records appear as a table in the Word document. When you export a report, the wizard exports the report data and layout — it tries to make the Word document resemble the report as closely as possible. Start the operation from Access To export data from Access to Word, you need to work in Access. There is no functionality in Word that can import data from an Access database. You also cannot save an Access database or table as a Word document by using the Save As command in Access. Objects you can export You can export a table, query, form, or report. You can also export only the records selected in a view. You cannot export macros and modules. When you export a form or datasheet that contains subforms or subdatasheets, only the main form or datasheet is exported. You need to repeat the export operation for each subform and subdatasheet that you want to view in Word. Conversely, when you export a report, subforms and subreports that are included in the report are exported, along with the main report. Outcome of the operation The Export - RTF File Wizard always exports formatted data. This means that only the fields and records that are visible in an object or view are exported along with the display format settings. Columns and records that are hidden, due to filter settings, are not exported. For a report, the layout of the report is also preserved when it is exported. Merging with an existing document When you export from Access to a Word document, the data is always exported into a new Word file. If you want the data to be inserted into an existing Word document, you must first export it from Access into a new Word document, and then copy the data from the new Word document and paste it into the existing document. Alternatively, you can copy rows directly from an Access table, query, form, or report, and then paste them into your existing document. Prepare your source data for the export. As part of this step, you make sure that your data does not contain errors, and you decide whether to export some or all of the data in your source table. Run the Export - RTF File Wizard. Optionally save your settings as an export specification for later reuse. The steps in the following sections explain how to perform each task. Open the source Access database. In the Navigation Pane, select the object that contains the data you want to export. You can export a table, query, form, or report. Review the source data to ensure that it does not contain error indicators (green triangles) or error values, such as #Num. Ensure that you have resolved any errors before you export the data to Word. Otherwise, you will find that such values are replaced with a null value. If the destination Word document exists and is open, close it before you continue. The wizard prompts you before overwriting the document. Note: You cannot append data to an existing Word document. In the Access database, if you want to export only a portion of a table, query, or form, open the object and select just the records you want. On the External Data tab, in the Export group, click Word. The Export - RTF File export wizard opens. Note: The Export commands are available only when a database is open. 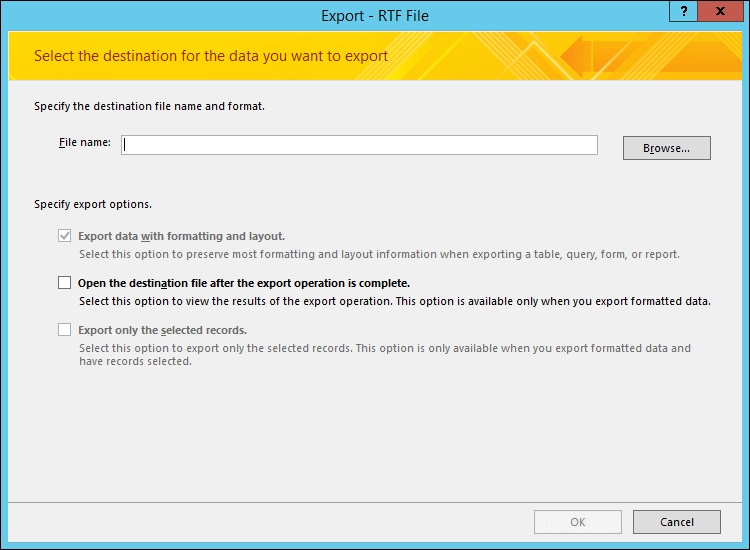 In the Export - RTF File wizard, specify the name of the destination file. The wizard always exports formatted data. If you want to view the Word document after the export operation is complete, select the Open the destination file after the export operation is complete check box. If you selected the records that you want to export before you started the export operation, you can select the Export only the selected records check box. However, if you want to export all the records in the view, leave the check box cleared. Note: This check box appears unavailable (dimmed) if no records are selected. If the destination document exists, you are prompted to click Yes to overwrite the file. Click No to change the name of the destination file, and then click OK again. Access exports the data and opens the destination document in Word, depending on the export options you specified in the wizard. Access also displays the status of the operation on the final page of the wizard. The following table describes how Access exports various objects and values to Word. This can help you determine what is going wrong if the export operation is not working the way you expect. When you export a table, a query, or a form, the field names are placed in the first row of the table in the Word document. When you export a report, the placement of the field names in the Word document varies with the report layout. A field in Access that supports multiple values is exported to a single column in Word. The values are separated by commas (,). All graphical elements — logos, data in OLE object fields, and attachments that are part of the source data — are not exported. Microsoft Graph objects are not exported. Expressions are not exported to the Word document. Only the results of the expressions are exported. When you export a form or datasheet, only the main form or datasheet is exported. You must repeat the export operation for each subform and subdatasheet. For information on how to save the details of your export into a specification that you can reuse later, see the article Save the details of an import or export operation as a specification. For information on how to run saved export specifications, see the article Run a saved import or export operation.